Wonderful trip to see many sights in one day. Definitely not enough time at each location, but a great preview for anyone who wants to get a glimpse of Taipei's recommended sights. 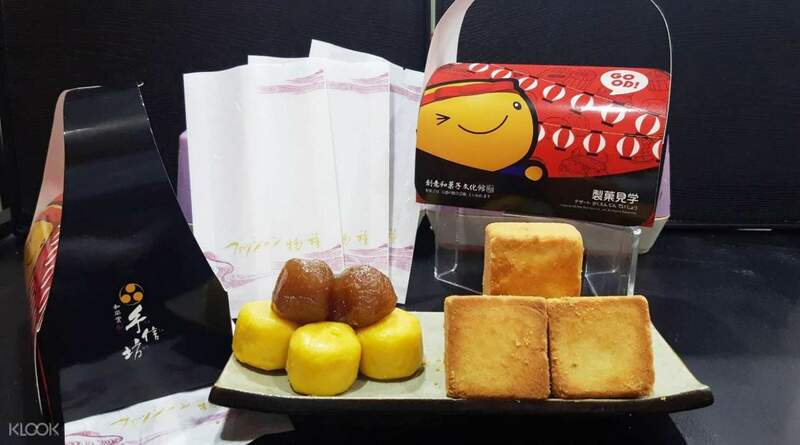 After enjoying the hip and fun city of Taipei, why not extend your exploration of Taiwan and join this Yehliu, Jiufen, and Shifen day tour with Taiwanese pastry making? Your day will start at Yehliu Geopark, famous for its interesting rock formations which were the result of years of sea erosion. 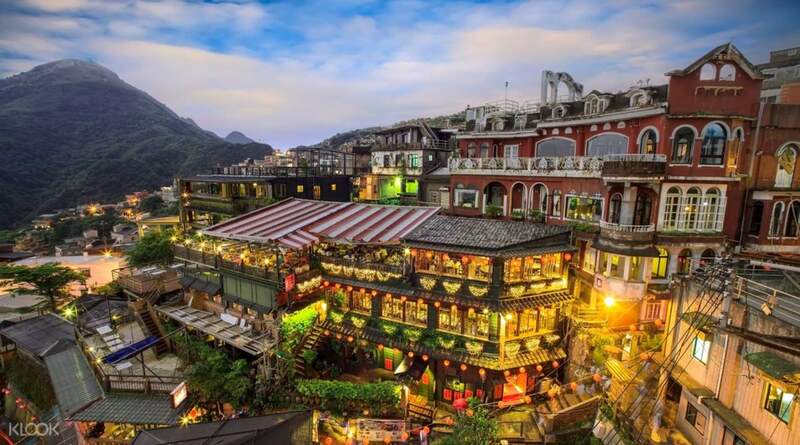 You’ll then head to Jiufen Old Street, a small mountain town that was once popular as a gold mining destination. Be careful not to be lost in Jiufen’s interconnecting alleyways and narrow streets while enjoying its variety of delectable street food! You can also say a little prayer at Shifen where you can choose and design your own sky lantern. For a fun ending after a long day, the tour will also stop by Shu Shin Bou Wagashi Museum so you can create your own pastries! This tour includes an English and Chinese-speaking guide to assist you through the day. 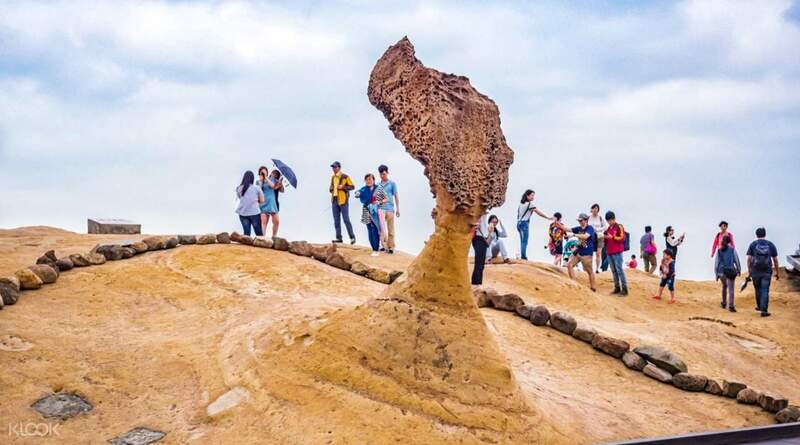 Join this day tour of Taiwan's northeast coast and see the Queen's Head at Yehliu Geopark! 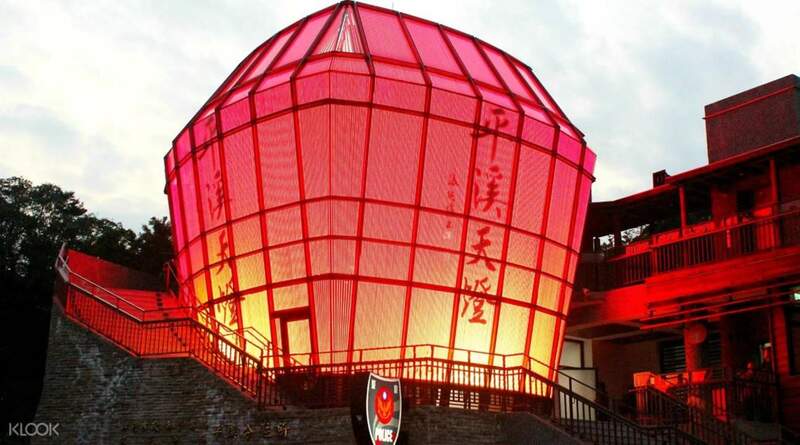 Design your very own sky lantern at Shifen, light it up, and release it to the universe! This tour was the best part of our Taiwan trip so far. It was so fun and very informative because of our caring tour guide kuya Philip ❤️ He also captured our beautiful group photos. We were able to experience a lot of things. Thank you Klook! Till next time! This tour was the best part of our Taiwan trip so far. It was so fun and very informative because of our caring tour guide kuya Philip ❤️ He also captured our beautiful group photos. We were able to experience a lot of things. Thank you Klook! Till next time! Our guide Andy was very good and very conversational. He was making sure we could understand the history of each place we visited since he spoke 2 languages, English and Mandarin. Shifen is organised in terms of lantern flying, we had only given a small time to do that around 40 minutes. Then, in Jiufen was sooo good in terms of foods and souvenirs. The old street in Jiufen became crowded when lots of tourist arrived since the street is narrow. And the tea shop was amazing, reminded us of the animated Japanese movie, Spirited Away. Lastly, the Yehliu Geopark, the Queen's Place. If you are having a good imagination of things, you should see those rock formations, it is natural. According to Andy, Queen's head rock formation will be gone in some years from now, so lucky us that we have seen it personally. Oopps, this is the super last stop, San Shu Gong Food Co, Ltd, we made our own pineapple cake and they gave it to us boxed so nicely for take out. They were generous to share yummy and delicious sample food and made us all tummy full. What a nice day tour!!! For those who wanted to see these amazing places, book now to Klook! Our guide Andy was very good and very conversational. He was making sure we could understand the history of each place we visited since he spoke 2 languages, English and Mandarin. Shifen is organised in terms of lantern flying, we had only given a small time to do that around 40 minutes. Then, in Jiufen was sooo good in terms of foods and souvenirs. The old street in Jiufen became crowded when lots of tourist arrived since the street is narrow. And the tea shop was amazing, reminded us of the animated Japanese movie, Spirited Away. Lastly, the Yehliu Geopark, the Queen's Place. If you are having a good imagination of things, you should see those rock formations, it is natural. According to Andy, Queen's head rock formation will be gone in some years from now, so lucky us that we have seen it personally. Oopps, this is the super last stop, San Shu Gong Food Co, Ltd, we made our own pineapple cake and they gave it to us boxed so nicely for take out. They were generous to share yummy and delicious sample food and made us all tummy full. What a nice day tour!!! For those who wanted to see these amazing places, book now to Klook! SO MUCH MORE THAN EXPECTED! At first we were worried about the sky lantern since rain was predicted at sunset but our tour guide Peggy re arranged the itinerary. We went to experience the sky lantern at Shifen first (around 10AM). It was not crowded and the guides were very helpful with the lanterns and picture and video taking. Better to already plan what you'll write on the lantern ahead of time. We then headed to the old town of Jiufen which was filled with souvenir shops and a few restaurants. This one was a bit crowded. The 2 hour stay here was just enough time to tour around it and buy a few things + lunch. The Yehliu geopark was next. One hour here was NOT enough given the queueing time for a picture taking at the queen. It took us already around 35mins just for the queen and just a few minutes to take pictures with the other rock formations (plus the walking time from the parking to the geopark itself). The pineapple cake making was superb as well! The short tutorial + a LOT of free tasting of their products were all amazing. We bought quite a lot of their cakes. You also get to bring home and eat the cakes you made! HIGHLY RECOMMENDED. THANK YOU, KLOOK! SO MUCH MORE THAN EXPECTED! At first we were worried about the sky lantern since rain was predicted at sunset but our tour guide Peggy re arranged the itinerary. We went to experience the sky lantern at Shifen first (around 10AM). It was not crowded and the guides were very helpful with the lanterns and picture and video taking. Better to already plan what you'll write on the lantern ahead of time. We then headed to the old town of Jiufen which was filled with souvenir shops and a few restaurants. This one was a bit crowded. The 2 hour stay here was just enough time to tour around it and buy a few things + lunch. The Yehliu geopark was next. One hour here was NOT enough given the queueing time for a picture taking at the queen. It took us already around 35mins just for the queen and just a few minutes to take pictures with the other rock formations (plus the walking time from the parking to the geopark itself). The pineapple cake making was superb as well! The short tutorial + a LOT of free tasting of their products were all amazing. We bought quite a lot of their cakes. You also get to bring home and eat the cakes you made! HIGHLY RECOMMENDED. THANK YOU, KLOOK! the best. we were able to cover all the three areas in one day without worrying about the places to visit, activities to do, the transpo and getting lost. the tour guide, Fifi was really nice. highly recommended. the best. we were able to cover all the three areas in one day without worrying about the places to visit, activities to do, the transpo and getting lost. the tour guide, Fifi was really nice. highly recommended. Try arriving at the meeting place earlier so you won't have problem with finding the exact spot but its not that hard. It was fun even though it was raining the whole day. Should check weather forecast before booking. Try arriving at the meeting place earlier so you won't have problem with finding the exact spot but its not that hard. It was fun even though it was raining the whole day. Should check weather forecast before booking. Wayne was our tour guide and he was so helpful and friendly + easy to approach when we had questions etc. the bus ride was really comfortable and the seats were quite spacious! would recommend if you just want to experience the places but it might be a little rushed as its all scheduled. Wayne was our tour guide and he was so helpful and friendly + easy to approach when we had questions etc. the bus ride was really comfortable and the seats were quite spacious! would recommend if you just want to experience the places but it might be a little rushed as its all scheduled. This is a great tour package and worth the money you’ll spend for it. Though be prepared to sleep most of the time because the destinations from one location to the next are far. In each stop we were given ample time to explore the area, except the Shifen part where we had 30 minutes to write on our lantern, light it up, and look at souvenirs. My favorite part of the tour was the DIY pineapple cake making, really fun and relaxing after a long day of walking and sightseeing. This is a great tour package and worth the money you’ll spend for it. Though be prepared to sleep most of the time because the destinations from one location to the next are far. In each stop we were given ample time to explore the area, except the Shifen part where we had 30 minutes to write on our lantern, light it up, and look at souvenirs. My favorite part of the tour was the DIY pineapple cake making, really fun and relaxing after a long day of walking and sightseeing.